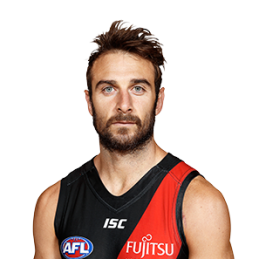 Jobe Watson was a professional Australian rules footballer playing for the Essendon Football Club in the Australian Football League. A dual All-Australian, three-time W. S. Crichton Medallist and representative of Australia in the 2014 international rules test, he captained Essendon between 2010 and 2015, and was the face of the Essendon playing group during its most turbulent period in the history of the VFL/AFL. Watson was one of 34 players suspended for using a banned performance-enhancing substance during the Essendon supplements saga in 2012. Watson had originally won the Brownlow Medal as the league’s fairest and best player during the season of the supplements program, but the title was stripped from him in 2016 as a result of the suspension. Watson attended Xavier College and was part of the Sandringham Dragons TAC Cup program en route to the AFL. Initially being trained as a key forward, he was under the immediate scrutiny that all Father-Son selections face well before and after his debut in Round 13 2003 at Telstra Dome against Geelong. Watson toiled away at VFL level and managed 12 games in 2004-05 under Kevin Sheedy and was told to build his aerobic capacity and fitness capabilities. Embarking on a boxing program with renowned coach Ray Giles, Watson shed seven kilos in the 2006 Pre-season. In 2007 Watson took his game to another level playing through the midfield and finishing second in the club’s Best and Fairest. Watson’s consistency stepped up another notch with him developing a reputation as a damaging inside midfielder. This progression saw Watson’s leadership qualities emerge and he was the reigns from Former Captain Mathew Lloyd far 2010. Watson finished equal seventh in the Brownlow and won the Crichton Medal as Essendon’s Best and Fairest. While his first year under new coach James Hird was plagued by injury in 2011, he managed to finish fourth in the Crichton Medal from just 17 games.